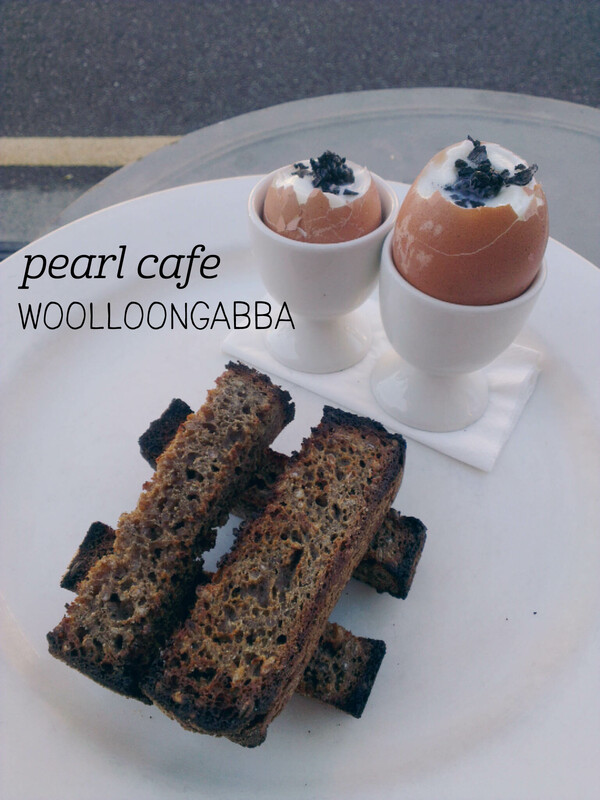 Pearl Cafe was recommended as a good breakfast spot by a friend – sadly on my weekday visit the lovely interior was booked out for a function, but the staff happily set me up on an al fresco table outside. The menu has some delicious-sounding options, but I only wanted something light given the humidity. I started with a glass of fresh orange juice and ordered the eggs and soldiers with caviar. Yes, you read that right. Pearl Cafe’s menu has some serious class, and this stylish twist on a classic was the proof in the pudding (or the eggs, as the case may be). The toast was a gorgeous rye with that amost sweet nutiness that really dark bread has. Each finger was dense and filling, and both eggs were perfectly soft-boiled with runny yolks. But the highlight was the pop of saltiness with a hint of the ocean from the caviar – I know it sounds like an odd combination, but every bite with it was divine. The only shame was that there wasn’t more to mix in for the bottom half of each egg. A highly recommended local favourite with friendly staff and style to boot. There is definitely a trend of using liquid nitrogen to make icecream/sorbet, probably because it has such a cool visual effect! I’m not even going to pretend to understand the science behind it, but suffice to say, it’s pretty awesome to watch. 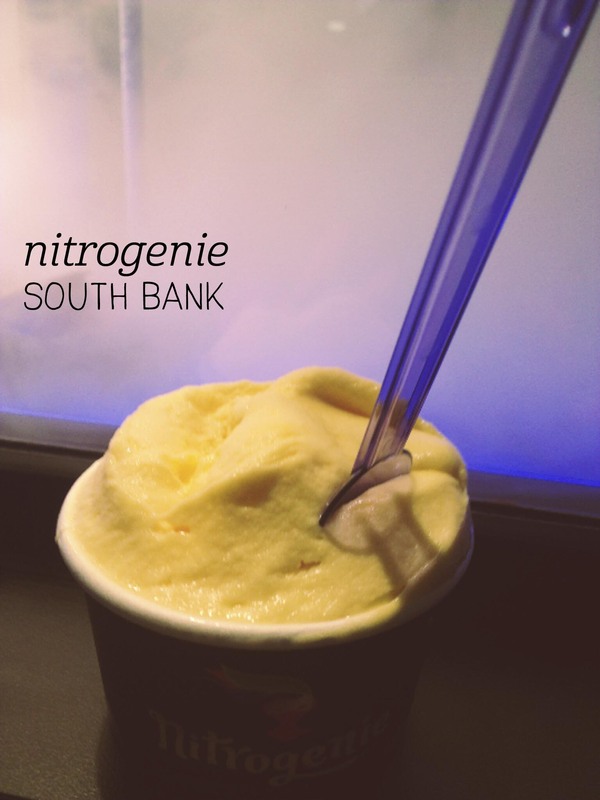 Having tried it for the first time in Sydney, I was pretty excited to find Nitrogenie making liquid nitrogen icecream in Brisbane. We went in on a warm evening and I was delighted to see that they had a fruity flavour – mango. Perfect for a tropical night. I ordered a small cup, which when it was ready was disappointingly small, but which turned out to be just the right amount after dinner. The mango flavour was incredibly intense – it really did taste like eating a mango (but colder)! There were even little stringy bits in it, just like a mango. My friend had the salted caramel and from the small mouthful I tried it was superb, although more on the salty side. We took our icecreams down to the river to soak up the night lights and warmth – quite an excellent Brisbane experience. Brisbane has some really lovely little cafes, and the Roastery is definitely one of the lovely ones. I was amazed to see the huge coffee roasting/grinding? machine housed in the warehouse next door – obviously the source of the cafe’s name – and a funky mural on the long corridor wall leading out into the courtyard. The space is cozy and the tables have succulents on them (my favourite!). 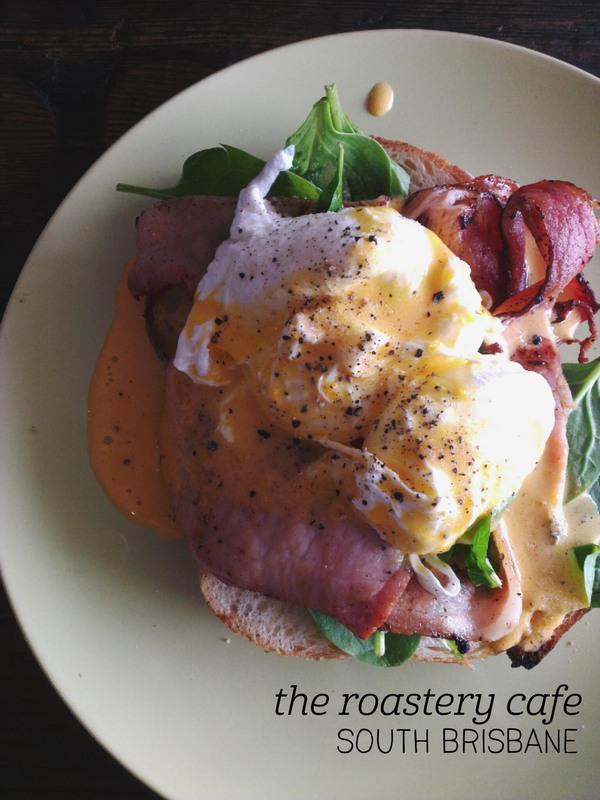 The breakfast menu is pretty extensive, so I went simple and ordered the eggs benedict – a standard test of the quality of a cafe. I also had their juice of the day, which was watermelon, apple, pear and passionfruit – such a great combination! The juice was served in a mason jar with a handle and it was a beautiful sunset colour. The meal itself was a little disappointing – the eggs had been overcooked and had pretty much solid yolks, and the hollandaise was a little chemically, but the bacon was beautiful and the bread was nicely toasted (my usual bugbear avoided). The cafe had a nice atmosphere with friendly staff, and despite its failings, was a nice change to the work-provided breakfasts we’d eaten all week. It’s probably no surprise that I’m a huge fan of sangria. It combines some of the best things there are – wine, fruit and spices. Mmm. 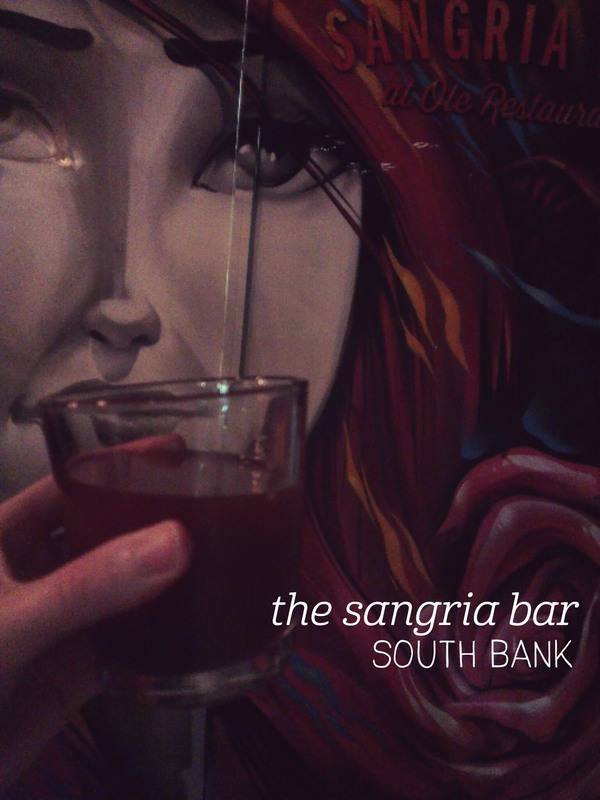 I was pretty excited to discover that Olé has a sangria bar attached to it when we were in Brisbane, and (even better), was within walking distance to our hotel. One thing I particularly liked about the Sangria Bar, which is something not common in Canberra, is that it’s an open shop front, with seats spilling out onto the pavement so you can sit and people watch. We ordered a couple of jugs of the ‘tinto’ – red wine with fresh apple, orange, and pineapple juice. The jug was reasonably sized, and the wine was good quality, matching the sweet fruit perfectly. Whilst we were there quite late on a Saturday night, it wasn’t too busy, and the music was pitched at just the right volume so we could still hear one another easily over the long table. Those who didn’t want sangria could easily get beer and in the end it was a really great night out. Definitely recommended as a chilled out venue for a late one. Brisbane is a pretty warm city, especially in summer, so inevitably you end up wanting something of the icecream variety to cool you down. Luckily, there are quite a few options – I was excited to see that Movenpick is one of them. I first tried Movenpick in 2009 in Auckland and was very impressed with the quality of their icecream and the variety of flavours on offer. Luckily the Brisbane store is equally impressive. 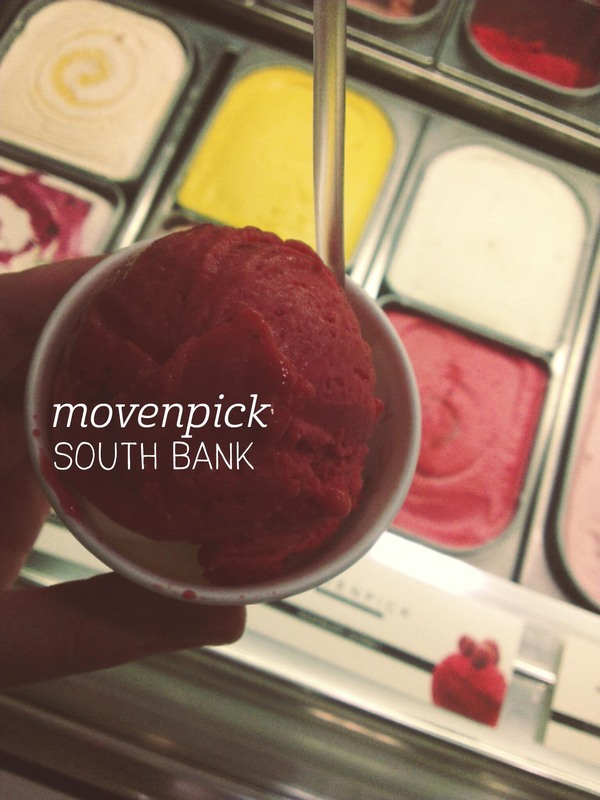 I will always choose a sorbet over icecream when possible, and I was pleased to see that Movenpick has a raspberry sorbet – one of my favourite flavours. I ordered a small cup and was amazed by how true the raspberry flavour was – the intensity of it was incredible. The sorbet is perfectly balanced between being tart and sweet, and even has little crunches of raspberry mixed throughout. The serving size was just enough for an after-dinner treat, the service was quick and the staff were friendly. Perfectly sweet and refreshing on a warm Brisbane night. When you have a big night out, a solid breakfast can be unappealing. You can also miss your alarm and rock up late. 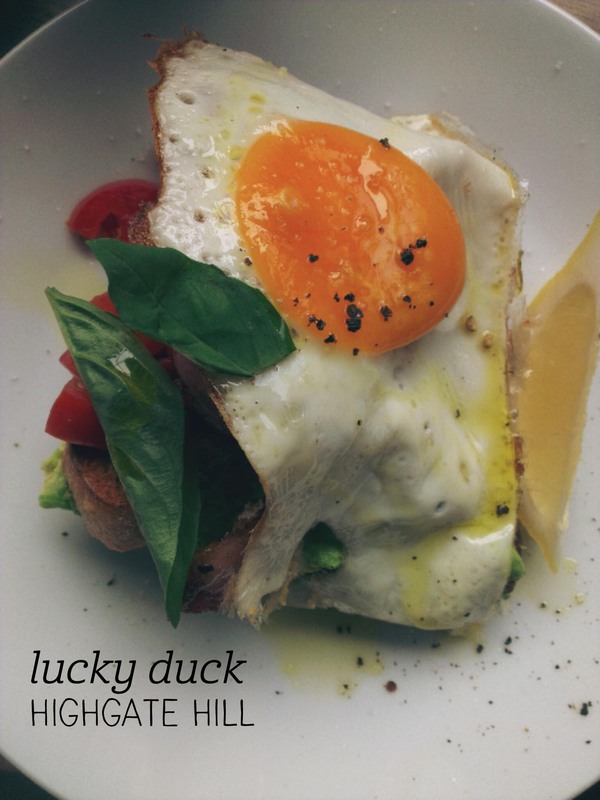 Despite both of these things happening, I had a fabulous experience at the Lucky Duck cafe and bar. Our group sat in the outside courtyard, which is beautifully set up with succulents on each wooden table and a beautiful geometric mural on the wall. The menu has a good mix of traditional and creative dishes, and I opted for the ‘Duck Bate’: bacon, avocado, tomato and egg on an open sourdough sandwich served with lemon, basil and drizzled with garlic olive oil. Mmm. I also ordered a ‘green juice’, which was advertised with a cheeky sign about Australia’s climate change policy. The juice was perfection – apple, pear, mint, cucumber, kiwi fruit and spinach balanced to refresh (and cure hangovers). The meal itself was equally perfect – the fried egg was still runny, the tomato was brought to life by the garlic oil, the avocado was generous and enlivened by the lemon. I also had a peek at all of the ducks hidden throughout the cafe – perched on shelves, in pot plants and painted on the walls. Such a fun place! 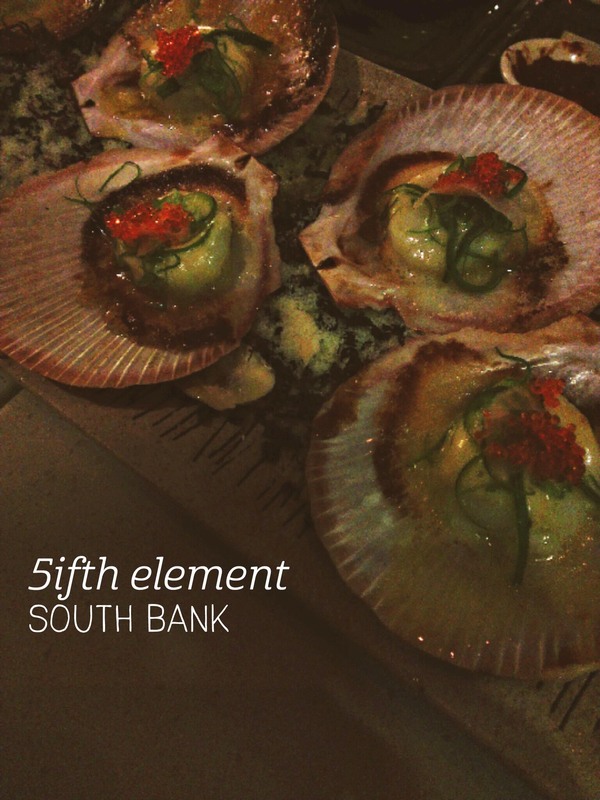 On a work trip to Brisbane, my colleagues and I found ourselves with a bit of unexpected time to eat out, so on a recommendation we went to 5ifth Element for their tapas plates (not because of the movie. Ok, maybe a little bit because of the movie). We ordered five dishes amongst the four of us, and every single one was amazing. We had a serve of crinkle-cut chips to start, which were tasty with the (somewhat small) serve of tomato chilli jam, and kept us going until the beef brisket buns came out. They were my favourite for the evening – thick slices of slightly sweet brisket, served with cucumber pickle in steaming hot bun wrappers. The brisket wasn’t quite melt-in-your-mouth, but whatever sauce it was cooked in was divine. More, please! This was followed by the lamb meatballs, which had a good kick to them, the chicken drumettes, which were beautifully flavoured with hoisin sauce, sesame and spring onion, and finally the Hervey Bay scallops, which were, as my friend described them, a textural delight, with pops from the fish roe on top. Each course was brought out by friendly staff and was well-paced – definitely somewhere to come back to.